While I was sitting on the couch, trying to figure out a topic to write about for Aloha Friday, I heard crying coming from the boys’ room. We rushed in to see NHL sitting up and asking to go home. That cry is the sign that he’s been having a bad dream. We reassured him that it was a nightmare. I sat by his bed hugging him while he fell back to sleep. Another dream I’ve had semi-regularly is one in which I discover that I can defy gravity. I simply decide to move off the ground and suddenly I’m floating. I can move effortlessly across the landscape at speeds that I couldn’t ever hope to achieve by walking or running. Floating/flying seems so natural that I begin to wonder why I didn’t realize that I could do this before. Of course, then I wake up and find myself still bound by the laws of gravity. My Aloha Friday question for today is: Have you ever had a recurring bad (or good) dream? I used to have 2 different bad dreams while growing up. I had them for years, and then all of a sudden stopped having them. The weird thing was when I told my parents about them, my dad said he had one of them, the same exact dream, too. i’ve had a recurring dream where my teeth fall out. and that’s so real and scary that i have to wake myself up to check. another scary one for me is registering for a math class and then forgetting to attend it. I use to have a dream that I ate a piece of candy, and all of my teeth fell out. I stopped eating hard candy for years after it happened three nights in a row. Yes, I have, it is odd and it’s always about my teeth hurting! I’ve had two recurring dreams…one is always some weird scenario where my teeth are falling out (and sometimes I’m even pulling my own teeth out). Very weird! The other recurring dream is about lions. I’m always in a different setting but right around the corner there’s a lion that’s on the loose and I’m terrified he’s going to come after me. Yes a couple – kind of one of each. After my really bad car accident, I’d have a recurring dream about it. I don’t remember any of it, to this day. But it would be like my mind was trying to create the scenario for me so I could be at peace with the traumatic experience and loss of my friend. Not really a recurring dream so much as a recurring theme. I frequently dream that I am back in college or high school and lost trying to find my classes or find out I haven’t done any homework or missed a major test. After I got my bachelor’s, I kept having dreams that I still needed to get stuff done. I don’t have the exact same dream but it’s always got the same theme to it. 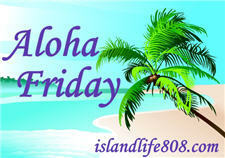 Jennifer @ Giveaways and More recently posted..Aloha Friday! Funny that you ask…I was going to do my Aloha Friday question on dreams, but changed my mind at the last minute. I used to dream very vividly, when I was younger. Rarely having any bad or scary dreams at all. But for the last couple of years, I really cannot remember any dreams at all..I know they say everyone dreams, but I really dont think I do anymore! hahah! I do Daydream a lot though! When I was younger… I haven’t had it for years but it was about me being in a car crash! I have two reoccuring dreams that I have several times a year. One has to do with a tidal wave and the other is about a stairway on the outside of a building that begins to separate from the building as I’m climbing it. The weird thing is…I would never go up a rickety stairway on the outside of a building. Happy Aloha Friday!! My most dreaded dream growing up was that I was being followed, usually by some classmates, and I didn’t have the power to run. Like something was keeping my feet from running, but I also felt like some sort of destiny power was holding me down and not giving me the right to gather my strength to escape. It probably had to do with some sort of deeper sense of guilt I guess. I have one reocurring dream. It is a good dream but he always make me sad when i wake up. My dream is about a beautiful white horse who ride on a wonderful hill full of green grass.